Writing Creatively: AutoCorrect Does It Again! Who loves a good laugh? Everyone I know! But busy days, heavy workloads, crammed time schedules, kids, and so much more take up so much of our time, we hardly give ourselves room for laughter. Every once in a while we need to take a break, though – and laugh – and by laugh, I mean laugh heartily. You know, the kind of laugh that comes when you practically double over and cry because you're laughing so hard? Well, here it is – AutoCorrect. I previously wrote an article where I provided a link to another site that posted Auto Correct mistakes, and a lot of what I read had me cry-laughing. That blog was part of a blog challenge and you'll find it by clicking Jokes Accidentally. And then a friend of mine posted on his FaceBook page the top 25 Auto Correct mistakes from 2011 (thanks again, Mark). If you have any "funny" in you at all, I can almost guarantee that you will LAUGH OUT LOUD when you read these mistakes. 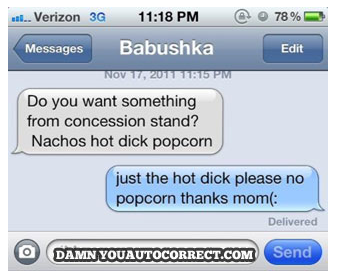 So, if you are in the mood for laughing, click Funniest Auto Corrects of 2011.